This afternoon, teens from our environmental education program were out cooking food at the Union Square Greenmarket in their pizza box solar ovens. One oven went above 200 degrees! As part of GrowNYC’s Environmental Education program, 31 students from DeWitt Clinton HS spent half a day clearing 3,800 square feet of bush honeysuckle invasive plants at Pelham Bay Park in the Bronx. The NYC Parks Department will follow the students’ work by planting natives in the area. NYC Media, the official television, radio and online network of the City of New York, recently profiled Learn It, Grow It, Eat It on LunchNYC. Our part starts at 6:40. Check it out! On Saturday, Market shoppers at Union Square indulged their sweet tooths on candy apples donated from Terhune Orchards, Locust Grove, and Migliorelli Farms and candied by Deb Gavito, owner of Body and Soul Bakery. Thanks to our wonderful Greenmarket volunteers, who were painting faces and distributing apples all day. Taste of Greenmarket 2010: A success! 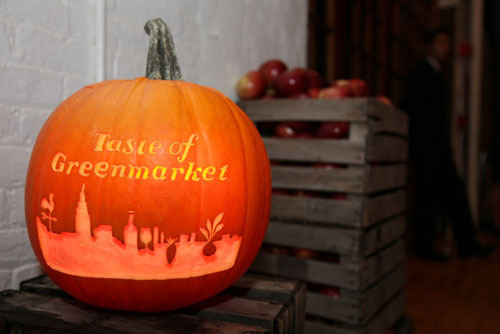 Our 3rd Annual Taste of Greenmarket took place on October 6th at The Altman Building and was a huge hit. Over 600 people joined GrowNYC and 30 of the city’s best chefs and mixologists, who were serving Greenmarket-inspired dishes and cocktails. The event benefited Greenmarket’s Youth Education program. Thanks to all our sponsors and everyone who attended. See you next year! 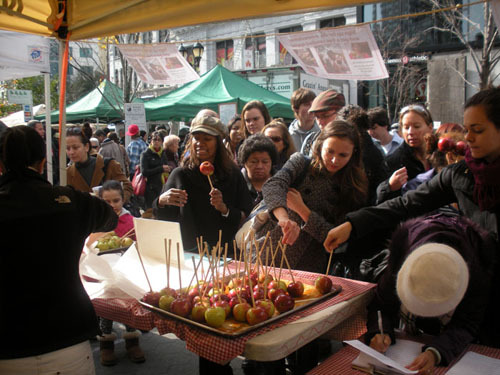 Read more about Taste of Greenmarket 2010: A success! We started our Learn It, Grow It, Eat It (LGE) program in 2005 as a collaboration between our community garden and environmental education programs. LGE students, from four high schools in the Bronx and one in Manhattan, take part in a three-part program: growing food in local community gardens; receiving nutrition education, which they then use to perform health-related outreach activities in their schools and neighborhoods; and operating a Youthmarket community farm stand where they sell the food they grow. Today was the second to last day at their Youthmarket, but the market was still full of produce from their garden. The last market day of the season is next Wednesday, October 27th, at Boston Road and 169th St from 10 AM to 2:30 PM. Take a look at some photos from their garden at Wishing Well Community Garden and from their Youthmarket. The Union Square Greenmarket had a different kind of green visitor on Tuesday: Sesame Street’s Rosita la Monstrua de las Cuevas, the first bilingual muppet, dropped by the Norwich Meadows stand to teach kids about healthy eating. Read more about Muppets take the market!